We first met Brody Sweeney at the National Restaurant Association (NRA) show in Chicago back in 2012. He had a restaurant concept, a name, “Camile – thai food to take home”, and a vision. We knew then and there that we wanted to work with him. He got the concept right away and stretched our thinking in ways we hadn’t thought possible. The following year, again at the NRA show, we saw Brody and his team at the event. This time in a bus line taking us back to the hotel. We explained beacons. He said, “Send me a few.” So we did. Again, Brody found a unique way to use the technology. Brody Sweeney is a unique individual with a vision. He has a vision for Camile and he saw where our technology could play a role. 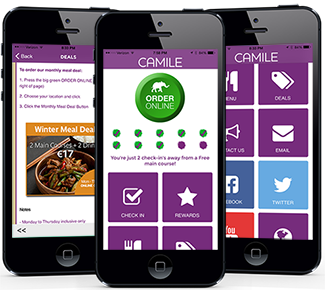 He knew the mobile experience was important, and he knew what he wanted the app to do – get people to order online. He also knew that people wouldn’t necessarily head back to their desktop when they were hungry. He saw what we saw. Smart phones were the answer. Everyone had one, and they used it whenever it made things easier. So, Brody made ordering great thai food to go easier. He had some simple directions – “the order online button, make it bigger”. So we did, and man did people use it. Camile is a wholly Irish owned company, established in the teeth of the recession in 2010. They have created a culture of excellence. Their young and enthusiastic managers, Thai chefs, packers, delivery drivers, waiters and counter staff are always trying to do the best job they can, to improve what they do and how they do it. We’re pleased to help them accomplish their goals. We just wished we lived closer to a restaurant, but heck, they turned us into an international company.